Corder estimated safe doses to use for epidemiological studies by studying reactions of patients in an allergy clinic. He said that reactions to the four compounds listed in the table are common, and may cause symptoms that appear to be allergy even though no IgE is involved. He said a chronic exposure can cause a chronic inflammation that mimics infection. Corder defined a 15% decrease in the amount of air expired in one second as a positive response, and did not discuss behavioral issues. 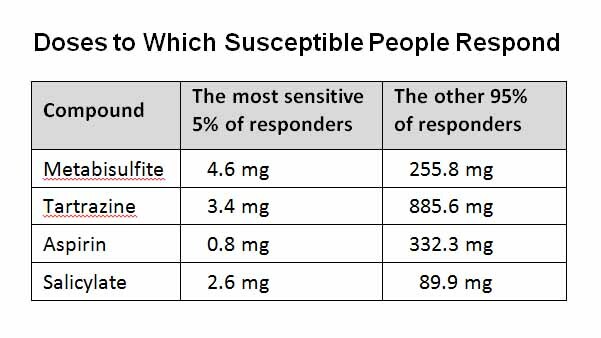 He identified doses to which the most sensitive (5%) and practically all (95%) susceptible persons might respectively respond. Levy (1978) total of 5 mg Yellow 5 per day, divided into 5 cookies. David (1987) 300 mg Yellow 5, divided into 50 mg & 250 mg doses. This entry was posted in 1991-1995, Asthma, Dermatitis, Eczema, Food Dyes, Hives, Preservatives, Research Studies, Salicylate. Bookmark the permalink.